Winter is coming! Crazy, we know. 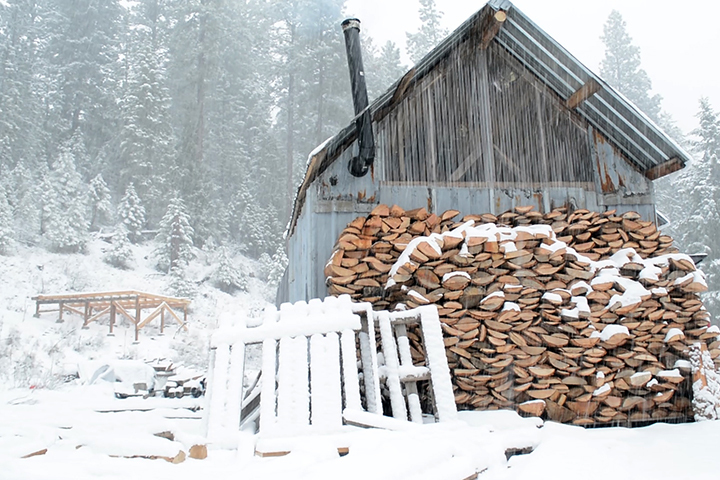 It feels like just a few weeks ago that we were hunkering down for our first winter in our off grid cabin, but in reality we’ve been gearing up to face this year’s winter for months now. Yes, we really have been planning for winter all summer long, and we’ve needed all the time we’ve had, and more! Last year we stayed warm by moving our RV into a tiny cabin / RV garage combo that we built from scrap material that we gathered for pennies. It was simple to heat and winterize, and that’s what we plan to do this coming winter too. If all goes well, we will start building our home next year, bur for now it’s a better choice for us to keep maintaining what we have rather than start a such a big, daunting building project right away. Spending the winter in a travel trailer isn’t an ideal living situation for a lot of people, but it works just fine for us. However, we spent the past few months making some big improvements in our winterizing cabin to make it more snug and efficient for this coming season. We’ll be dressing as warmly as possible, of course, but we want to do a better job of heating our living space as well. Because we arrived at our property late in the season last year, we had to make do with crappy firewood. Most of our supply came from soggy mill ends and they were hard to burn. This year we are more prepared- we’ve been harvesting out own firewood for months and now have a good supply stocked up. But there was one problem that we only just solved; installing a better wood stove in our cabin. This year’s firewood… so lovely! It was worth the effort to get! The stove we used last year was adequate, but we wanted an upgrade. On the coldest nights last year, the firebox was too small to bank with enough wood to last until morning, so we had to get up in the night to restock it. This messed with our sleeping schedule and left us uncomfortable and groggy. Last year’s barrel stove. It did the trick but it certainly wasn’t what we wanted for this winter. For this reason, we were thrilled to come across a (much bigger) old fisher wood stove at a yard sale for about $100. We’re not going to lie, this stove was a big ol’ rust bucket when we came across it, though there wasn’t any damage that a few quality hours with a wire brush couldn’t fix. Now our new-to-us stove is gleaming and should be ideal for our heating needs. Our previous stove had a six inch chimney and was only single wall. Frankly, we dodged a bullet that it lasted all winter without problems, and we didn’t want to test our luck again. We don’t recommend this size, and this coming year we’ll be using a triple wall chimney instead. Installing our new chimney proved to be a tricky problem. Our cabin isn’t anywhere near airtight (in fact, we like it that way- a little ventilation is a good thing!) but that doesn’t mean we wanted all our hot air leaking out where the chimney connects to the ceiling. It was necessary to proceed with caution in order to set our system up correctly and safely. Note: If you have building codes in your area you won’t legally be allowed to build a chimney system like this. An EPA-approved chimney pipe will be needed instead. When we installed our old stove pipe last year, we wanted to do a through-the-wall installation that meant we needed to go through the roof. We chose to do this over the eave so that it didn’t matter if it wasn’t water tight- it would just leak outside! For this new chimney, however, we needed to go right through our main roof. Last year’s chimney that came through the eave. How do you fit a 12 inch diameter chimney through the roof without getting leaks? It’s not easy. Things were more complicated because our roof is corrugated metal and a 45 degree angle, making it difficult to find the right size flashing. We ended up with a “maxi flashing”, a big, rubberized piece of flexible flashing that looked like overkill but turned out fine. In order to make the perfect cut for our ceiling, we found a calculation on the internet (thank you Google!) that worked great for the measurement we needed. Installing the chimney cap took us a while, but we finally got it done. We also took advantage of our stove swap to upgrade our hearth in order to get more thermal mass and extra heat. When the stove was finally installed like we wanted it, we tried it out just to make sure we weren’t going to burn our house down. Constructing the new hearth… okay, we just moved the old one! The good news? It worked great! A laser thermometer showed that the temperature right where the stove pipe met the roof was about 80 degrees- well within the safe range for our home. Our new stove is set up and we are looking forward to a snug, cozy second winter in our winterized cabin setup (plus soaking in our new wood-fired cedar hot tub that we built prior to building our home). Prepping for the cold during summer and fall was occasionally a pain, especially when we’d rather be foraging for wild food and going crazy with canning, but we know that all our efforts will be worth it when we have a warm home to retreat to all winter long. The last things we need to do to be 100% ready for winter are upgrade our off grid water system (hint… we have a 1,700 gallon direct-bury cistern waiting to be installed!) and put the finishing touches on our solar power system. The race is on… what can we get done in another month? Stick around to find out! Looks great and will feel even better when it gets really cold. Putting your home canned goodness nearby wil keep it from freezing and warm your stomachs and hearts every time you pop off a canning lid. Good work! That’s exactly what the plan is! I have saved up my questions & comments: 1) do you leave your trailer door open in the winter when your fire is going. 2) I assume your trailer is stabilized with jacks, any settling? 3) have you perc tested your land? 4) the retaining wall you built at the entrance to your drive is amazing. A+++ to you guys on that one. 5) Man I don’t even have a hot tub. One can only dream. Smart move, nothing like taking care of yourself after a hard day on the homestead. 6). Love the location and view. Smart buy. 7) end for now – I am dying to watch the water system evolve. Rainwater capture is a passion of mine but I understand the challenges for you. I do admire your inguinity; you two seem particularly bright and willing to do your planning the right way. I love being a subscriber. 1) Yes. We leave it open always for the most part so that the cats can get in and out (they have a small cat hole in the cabin to access the outdoors). If it’s REALLY cold, we may shut it so that we can heat the inside with propane and just get up at night if the cats want out. 2) Trailer is stabalized with jacks. No settling… but in the windstorm last year, the trailer got a good shove which we fixed a couple of months ago. 3) Yes, perk test was done before we had septic put in. Great drainage. 5) We didn’t realize we could have one for such an affordable price… maybe you can too! 7) We really hope we can get the cistern in by winter… but it’s a big project! It’s interesting for us to watch it evolve too. So much to think about. Rainwater collection is definitely on the to-do list one day. And glad you love following our journey! It’s nice to share it with others! I love Fisher stoves. I don’t think they make them anymore, but we have two and they are really great stoves. We have had three altogether and they have always kept us warm and toasty. They make a screen that goes on the front if you can find one. It’s kind of nice to sit and watch the fire going on a cold night or a rainy day. I love your blog and I like how you are doing everything a little at a time and debt free. Very smart and you will get where you want to be eventually. We don’t live off the grid, but we have two acres with a small pond and a garden. Nancy, have you ever had problems with the doors on your Fisher warping and smoke seepage? Ours are warped (see my comment below). Do you seal your doors with anything for an airtight stove? Is it possible for you to set up wind paperboard behind the corrugated walls on the outside? As you have discover by now, wind tight is more important than isolation. Also try to seal around the doors and that “window”, they are classic trouble areas. Try putting bricks on top of the oven, to retain heat. Some people over here put big pots with water on top of the stove. This can also help. If you want to brighten up the inside, consider making you own linseed oil colour. We use our own mixes for barn doors and the like. Mix 50 % boiled linseed oil, 10 % zink white pigment for mould protection and 40 % of the pigment colour you like. Super easy and cheap and the best wood protection you can get. I think I have seen a site in New York that sells all kinds of pigments. It’s a very wise decision to postpone the start of the barndomium build to Spring. Building during winter is sheer hell. Keep on going, it’s a marathon run, one step at a time. It’s raining today here in Redding, California. Yippeee!!!! Anyhoo, we have a Fisher, but a different model. It’s about the same size but flat on top. It’s our only heating source and came with the house when we bought it a few years ago. I mentioned in a comment before that the doors are warped. Do yours show any signs of warpage? Is there a seal around them? Has anyone suggested you add some piping of some kind for a tighter seal? I’m going to talk to some wood stove specialists this week to see if we can either replace the doors or jerry-rig a seal so we don’t risk smoke in the house and get a better burn. If anyone reading this has any suggestions, I’d sure welcome some suggestions. Thanks! My parents drove through N. California today and they said the storm was crazy! Glad you’re getting some rain! Hmm… we don’t see any warpage but we aren’t sure what to do on the seal, or if it needs one. We bought a gasket but it turns out it was way too thick and we couldn’t get the door closed. We’re doing some test heating right now just to learn the stove’s personality and so far, we’re able to shut it down quickly by closing the air intake and shutting the doors. It does appear to seal pretty tightly even if it’s not air tight. I’d love to hear others experience with Fishers too. I’m Happy for you guys I’ve wanted to live like that since I was 15 my Mom took me to a shrink only to find out Nothing was wrong with me I’m now 63 and my dream is fading I worked in a factory all those years hating every minute such as too take care of my wife and three sons . Look forward to staying in touch with you guys!! Thank you Alyssa for inspiring others by sharing your journey! Mark don’t let your dream die! I work a desk job in NYC and have been living in this concrete jungle since 1988. I can’t wait to one day get away from it and live in a more natural setting. Family obligations for me also delay this. Not sure if I’ll be able to full-fledge homestead, but it won’t stop me from planning on some form of closer to the land living. In the meantime, day trips, camping and learning about wilderness living keep me stoked. Don’t give up! “Never put an age limit on your dreams.” Dara Torres, 12 time Olympic medal winner, she competed in the 1984, ’88 and 1992 Olympics, then made a comeback in 2000 at age 33 to become the oldest Olympic swimming medalist…but she didn’t stop there and came back at age 41 to take silver medals, with a world-record setting split time in the 400 meter relay. This lady was tenacious, with 6 world records. She didn’t give up on her dream and neither should we! I had a Coalbrookdale wood stove & repointed all the seams on the stove every year. This allowed the wood stove to last long time. You get the pointing stuff at a Woodstock store or maybe hardware store.. it’s a black gritty cement like material that is put in a caulking gun. I put it on with plastic gloves and smudged it along seams with my index finger. To test it you spay soapy water on seams & if any air leaks , bubbles appear. Just go slow when repointing and read directions for curing. Hi! Love to keep up with your adventures! I’m anxiously awaiting the review on the stove!! The insulated chimney will help with the draft (the inner wall will stay hotter then the longer single wall in the outside air). Don’t be afraid to get the damper as high in the pipe as possible so more heat is retained in the house. That’s an “old timey’ trick. If you look close at pictures of old homesteads the chimney would go some distance before it went out. The cabins in cold areas would sometimes have the stove at one end of the room and the chimney would go the whole length of the room before going out (with an adequate rise). That’s where you would hang your clothes to dry… beside the chimney. Be creative… maybe have the chimney traverse the entry of your Barndominium so there will be heat to dry the wet coats of winter??? Stay Warm! I was curious about why they didn’t run the stack diagonally across the cabin to get more heat out of the stove and if the wind is a problem you can buy vapor barrier in rolls, it would be worth it to take down the siding and seal the walls then put the siding back up. hot air is lighter than cold so you have t think in terms of sealing the cabin from the top down in order to trap the heat in. Great videos wish I was doing that. I wouldn’t be able to cause I suffer from random thoughts and would never get anything done. Great job! So enjoy your posts/videos. You do everything so well. Looks like you put a lot of thought and research into each of your projects. LOVE the stack of mason jars in the background! Much happiness to you two hard-working lovely people! – A can of Great Stuff Goes a Long way in sealing up cracks in the walls, thou it’s not pretty, You could probably source some Oakum if you care about aesthetics. -Good Idea on a hearth that has lots of mass and holds lots of heat. Might want a cast iron kettle to put moisture in the air as well? Vogelzang makes one that is cheap. -Do you have ice breakers on your steel roof to keep a sheet of frozen ice from killing someone? -Good height on your Chimney, should draft like a Champion. Stack should always be higher than roof line. Have you thought about insulating roof, as tin is not a very good insulator? -You are burning pine so you must watch your chimney like a hawk. If it builds creosote you must remove. Running Triple wall entire way is smart, as it will stay hotter. What is your plan if you do have a chimney fire? Air sucking flare/Lg Fire Extinguisher? Did you put in a chimney clean out? -Do you have a spark arrestor screen? -Are you going to sprinkle the wood ash on your likely acidic garden soil. It works great, but too much can be as bad, as not enough. PH matters. Hope I didn’t sound bossy, just reflections from my past ie mistakes I made you can learn from. *Familiar with Caframo Fans (Peltier Effect)? They don’t move a ton of air (~300CFM) but they never need turned on and do help. They are somewhat fragile and they are expensive. **I make fire starters from free using Cardboard Egg Cartons filled with sawdust and melted old candles (#10 Tin on Stove). Stick a Strike Anywhere match in middle before they harden. I give tons away every year since others give me candles and cartons they scrounge. I’ve been off grid in the Canadian north for 12 years now. Originally I had a very large Fisher stove with a huge rectangular firebox BUT it burned wood poorly & unevenly & temperature control was also poor, and as a result I had a LOT of creosote build up. As well, it burned through wood quickly on the coldest days & produced just plain dirty exhaust smoke, even when burning hot. After one year of being quite cold & after a LOT of research, I opted to spend the $3000 for a BlazeKing woodstove with a catalytic burner & have NEVER looked back. I highly recommend this brand of stove, a Princess for smaller homes & a King for larger spaces. You can read about them on their website, but ever other brand that I’ve read about, seen with friends & neighbours & youtube videos, NONE compare in real world performance. As a bonus & important to me, is that they burn very clean with the use of the catalytic burner & my first one lasted 6 yeas & was replaced for $300, cheaper on eBay but I hate eBay, so I bought from a local dealer. I have recently seen them on websites such as Craigslist or specifically here in Canada a site called Kijiji for $500-1000 for either model of BlazeKing & today, I would go that route & be patient & buy used, but I don’t regret my choice. My old timer neighbour, who once swore his stove was good enough, bought a new BlazeKing last year as he was astonished at how little wood I burned compared to him & despite my cabin being twice as large to heat. Cutting firewood gets more difficult as we age & he is in his early 70’s. Keep an eye out for a used / nice shape BlazeKing woodstove would be my one best recommendation to you. That Fisher that you got looks awful to use to me & frustrating & leaky. Good thing you didn’t pay much for it. P.S. I also cook a every day that I burn my BlazeKing, which cuts down greatly on my propane & generator use. (Now just have to get the fridge off of horrid propane.) I do pan pizza or pot baking, slow cooking stews & soups, or just warming left overs, even use my pressure cooker, as well as my hot water heating, even though I have a propane hot water heater but that just uses too much fuel whereas the BlazeKing water in a big pot is free residual heat. Pour the pot into a tank in the loft & then gravity fed hot / warm water to give take a shower. The BlazeKing King that I have has a large flat top, which I insisted on for cooking purposes. I have had wood stoves in the past and have a recommendation to be safer. Make the hearth in front of your stove come out further. With the doors open and a good ash pail sitting in front of stove you should have enough room to clean out hot ashes and if a ember pops out of stove while loading , it lands on the hearth instead of on the floor. A lot of places (planning dept, fire dept, city hall ,etc.) will have the safety code measurements around a wood stove or fireplace. I want you to be safe. You do not need a fire that could have been prevented to destroy your already hard work. Keep up the good work and be safe out there.